The conference for new ideas, new paradigms, and reflections on everything to do with programming and software. Onward! is more radical, more visionary and more open than other conferences to not so well-proven but well-argued ideas. We welcome different ways of thinking about, approaching, and reporting on programming language and software engineering research. Onward! fosters the multidisciplinarity of software development. We are interested in anything to do with programming and software. Processes, methods, languages, art, philosophy, biology, economics, communities, politics, ethics, and of course applications. Anything! 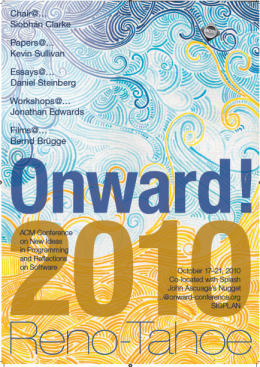 Join Onward!, the unique, creative and collaborative environment to discuss and investigate challenging problems related to software, its creation and nurturing. This site uses valid HTML and CSS. All content Copyright © 2010 Onward!